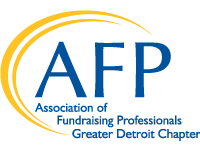 The Association of Fundraising Professionals (AFP) Greater Detroit Chapter Marjorie S. Fisher Fellows (Fisher Fellows) program strives to educate and empower the future generation of fundraisers in the region and is supported through the generosity of the Max M. and Marjorie S. Fisher Foundation. Those working in small organizations with limited development support are encouraged to apply. Applications for 2019 are now open. Please contact Ashley Calhoun at ashleyjcalhoun@gmail.com or Stephanie Maurice at smaurice22@gmail.com with any questions. 2019 Marjorie S. Fisher Fellows Application, click here. Applications are being accepted online through April 5, 2019.